Awesome Quotes: 15 Important Etiquette Rules That Everyone Should Know By Now. 15 Important Etiquette Rules That Everyone Should Know By Now. Etiquette is all about how to conduct yourself beautifully in every situation. The basic rules of etiquette are simple. It’s a combination of proper speech, common courtesy, neat appearance, and controlling your emotions. #1. When you say, ’I invite you,’ that means you pay. If you say, ’Let’s go to a restaurant,’ then in that case, everyone pays for themselves. If a man offers to pay for a woman, she must agree. #2. You should never visit someone at their home without making a call. In case you appear on their front door all of a sudden, you may find them in their pajamas or bathrobe. #3. Never place your smartphone or tablet on the table when you are out. This gesture shows that your smartphone is more important than the meeting you have and people may think that you are bored. Most people will be offended if you are checking Facebook’s news feed while they are talking. That’s rude! #4. Don’t ask a woman on a date in case you are planning to make calls and send text messages all the time. #5. Men should never carry a woman’s bag. On the other hand, they may take her coat and leave it in the cloakroom. #6. If you are having a walk with another person, and she/he greets someone with Hello, you should say Hello as well, even though you don’t know the people. #7. If someone offends you, you should never return the favor or raise your voice. Never sink to their level. Smile and leave the ill-mannered company. #8. A man should always walk on a woman’s left-hand side, unless they’re in the military, because they should be ready to salute. #9. Nine things that should never be discussed: age, wealth, family quarrels, religion, medical problems, love affairs, gifts, honor, and disgrace. #10. In the cinema, theatre, or concert hall, you should always move to your seat facing those sitting and men always go first. #11. Women should not be touched by men without their strict permission. In other words, taking a woman by her hand, holding her hand, pushing her or touching her while you are talking is strictly forbidden. #12. In case someone is trying to get your attention in a primitive way (by saying something like “Hey, you there”, ignore them. #13. When it comes to using perfumes, moderation is crucial. In case you still feel the perfume after 2-3 hours, you can rest assured that people around you will get sick of it. #14. It doesn’t really matter whether you are a CEO, a professor, a student, a doctor or an older woman, whenever you enter some room you must greet everyone inside. #15. 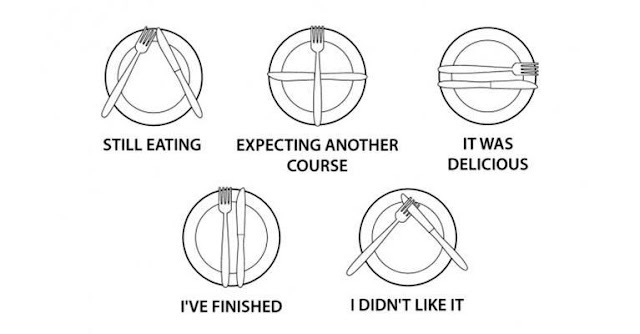 Place knife and fork as shown below to let others know whether your meal is finished or if you are waiting for dessert. The goal of such rules is to make the world a better place. Sometimes, acquiring these good manners can be hard or may need some time, but be patient and master them to perfection. That will be a great trait of your personality.